In my opinion, there are two basic types of markets for hardwood lumber. I refer to these markets as commodity and character. The commodity market is the primary market, hundreds of times larger than the character lumber market. Huge milling operations that may put out many thousands of board feet per week. For commodity lumber, extra-wide boards demand a premium price, as do thicker boards. Rarely do they offer characteristics such as crotch figure or live edges. 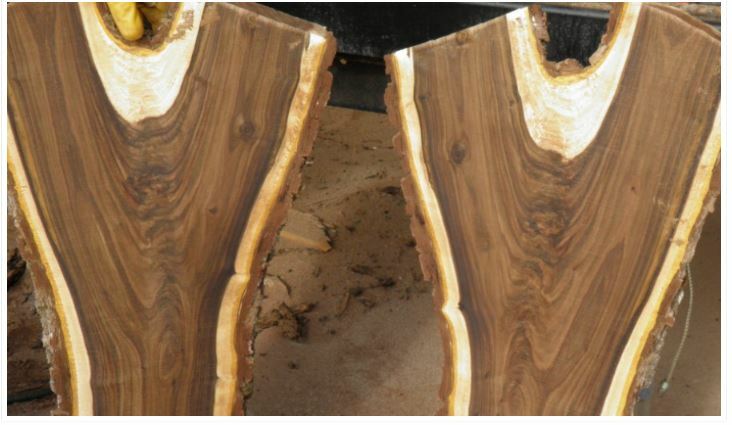 The journey from a growing tree to a piece of furniture has many steps. Every step in the process involves risk, investment, waste, and profit. The earlier in the process you acquire your lumber, the less expensive it will be. The potential cost savings involves an investment and some risk. Each of the persons in the process must cover their expenses or go out of business. If there is no profit, they’ll often find something else more rewarding. Depending on your needs, that $5 p/bf walnut board may be a bargain. Logs are heavy. It takes ingenuity to remove a 4000 lb log from someone’s back yard, through a fence gate, without tearing up the lawn (which is one reason why many urban logs are cut into short, easier to handle, pieces). Then there is the issue of loading those logs on a truck or trailer and transporting to their next stop; a sawmill, or a landfill/dump/chipping facility. Of course, in commercial operations there is an abundance of heavy equipment designed to perform those functions efficiently. To get the full context, read the entire blog – and others – on Tom The Sawyer’s website.